Equipment and preparation: You'll need a non-stick lipless baking sheet about 34cm x 30cm/13in x 12in. Preheat the oven to 200C/400F/Gas 6. Remove the filo pastry sheets from their packaging and place them on a clean work surface. Keep them covered with a clean, damp cloth while you're working, to stop the pastry from drying out. For the filling, heat half of the olive oil in a frying pan. Add the sliced the onion and gently fry for 5-6 minutes over a medium heat, until lightly browned and softened. Heat the remaining olive oil in a large, heavy-bottomed pan. Add the spinach and cook, uncovered, for a few minutes, until it wilts. When the spinach is cooked, place it in a colander set over a bowl to drain and cool. Discard any liquid that comes out. Remove the fried onions from the frying pan and place on a plate to cool. With a sharp knife, trim the filo pastry sheets to a size just smaller than your baking sheet. Place a sheet of filo pastry on the baking sheet and brush with some of the melted butter, using a pastry brush. Repeat with four more filo sheets, brushing with butter as you go. This will be the base of the pie. Cover the remaining five filo pastry sheets with a clean cloth. When the spinach has cooled, place it into a large bowl. Grate in some fresh nutmeg and season with salt and freshly ground black pepper. Stir in the sultanas, the cooled onions and the pine nuts. Crumble the feta into the mixture and mix together well. Beat the eggs together in a clean bowl. Add some of the egg mixture to the spinach mixture. Add just enough so that the mixture is moist but not runny (you may not use all of the beaten egg). 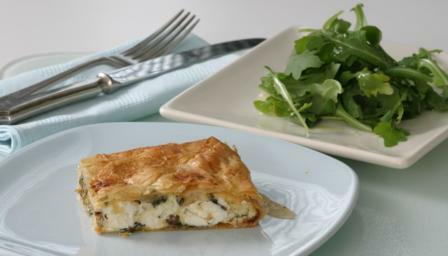 To assemble the pie, spoon the spinach and feta mixture onto the prepared filo pastry base. Leave an empty 'frame' around the edge of about 4cm/1½in on each side. Fold the four edges of the pastry in towards the middle to enclose the filling. To make the top of the pie, trim the remaining five sheets of filo pastry to the size of the base with its folded-in edges. Brush one of the filo sheets with some of the remaining melted butter and place on top of the spinach and cheese mixture. Repeat with the remaining four sheets, brushing with melted butter as you go. Brush the top layer of filo pastry with the last of the melted butter. Lightly score the top of the pie with a sharp knife. Bake it in the preheated oven for 45-50 minutes, or until the filo pastry crust is a deep golden-brown. Serve slices of the pie with a rocket salad.